The Prime Minister has completed the new Ministerial team for Scotland. Danny Alexander is joined by David Mundell and Lord Wallace of Tankerness QC. The Prime Minister has completed his ministerial appointments to the Scotland Office and the Office of the Advocate General for Scotland. Danny Alexander MP has been appointed as Secretary of State for Scotland. David Mundell MP has been appointed as a Scotland Office Minister. The new Advocate General for Scotland is Lord Wallace of Tankerness QC. The Advocate General is one of the UK Government’s three law officers along with the Attorney General and Solicitor General. The office of Advocate General for Scotland was created in 1999 by the Scotland Act to be the chief legal adviser to the United Kingdom Government on Scots law. “I am honoured to be taking up the role of Scottish Secretary at a critical but hopeful time for our country. The new coalition government will do things differently from the past and we are determined to get to work quickly and efficiently in the national interest. “Scotland faces the same challenges as the rest of the UK over the coming months and years. I have already spoken to the First Minister and we agreed it is essential for both governments to work together. “I am excited to be leading such an experienced and determined team. With David and Jim I really believe we can serve Scotland’s interests and change the tone of Scottish politics for the better. “It is a privilege to be appointed to the Government at what is an important and historic time for our country. I look forward to playing my part in a cross-party team in the Scotland Office, as well as in the first coalition government the country has seen for 65 years, to improve our nation’s future. 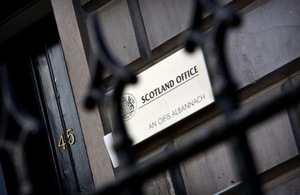 “The Office of the Advocate General conducts important legal business on Scotland’s behalf. It is a challenge I am looking forward to as well as helping to implement significant political and constitutional reform in the UK. The Government will be introducing major new legislation to Parliament, including the Calman proposals to strengthen devolution, and I will be working very hard to ensure it’s passage through the House of Lords. Danny Alexander is the Member of Parliament for Inverness, Nairn, Badenoch and Strathspey. He will be a full-time Minister at the Scotland Office which has offices in Dover House in London and Melville Crescent in Edinburgh. He is the first Liberal Secretary of State since the Earl of Rosebery in 1945. Mr Alexander has been an MP since 2005 and served as Chief of Staff for Liberal Democrat Leader, Nick Clegg, since 2007. David Mundell, is the Member of Parliament for Dumfriesshire, Clydesdale and Tweeddale. He has been the MP since 2005 and before that was a Member of the Scottish Parliament from 1999 to 2005. He served as Shadow Secretary of State for Scotland in Conservative Leader David Cameron’s Shadow Cabinet. Lord Wallace studied law at Cambridge and Edinburgh universities and has been an advocate since 1979 and took silk in 1997 . He practised at the Scottish Bar before entering Parliament as the MP for Orkney and Shetland in 1983. Jim Wallace was leader of the Scottish Liberal Democrats from 1992 until 2005. He became the Member of the Scottish Parliament for Orkney in 1999 and stood down from the UK Parliament at the 2001 General Election. Jim Wallace served as Deputy First Minister in the Scottish Executive for the first 6 years of devolution from 1999 to 2005. In 2005 he resigned as leader of the Liberal Democrats in Scotland and as Deputy First Minister. He stood down as an MSP at the 2007 Holyrood elections and was appointed to the House of Lords in the same year.